There’s a wide selection of end tables to choose from that can complement your living room furniture and décor. End tables will vary in style, shape, and material, but regardless, the end tables you choose will help define your living space and provide functional furniture for your family to utilize while gathering. In many cases, end tables can be a better living room option than coffee tables, because they take up less space, are more affordable, and can be placed in closer proximity to couches and chairs. Whether you’re into a more traditional look or a modern feel, the possibilities are endless. In this guide, we’ll provide you with an overview of the most common types of end tables so that when you begin furniture shopping, you’ll know exactly what to look for. Your living room should be a place where your family is able to feel comfortable and at home. Everyone will feel more at peace once you have the proper furnishings in place. One of the most popular types of end tables you’ll find in furniture stores and online is the traditional style end table. Most traditional style end tables will be made of wood and have sturdy legs, elegant features, and a homey feel. If you want your living room to feel classic and comfortable, yet upscale, traditional end table will be a great touch. However, wood can be delicate when putting food and drink on it, so be sure to pair these end tables with some coasters to match. The terms contemporary and modern sometimes get used interchangeably, however, contemporary refers to current and future design patterns, while modern refers to a specific era and style. Contemporary end tables may feature bold accents, glass and metal material, and a sleek feel. The contemporary style can change, but if you want your living room to feel fresh, unique, and stylish, adding contemporary end tables as statement pieces will do the trick. The modern style became popular in the late 20th century, but it is still very popular in home furnishings and décor today. Modern end tables are easily identifiable by their minimalist look, sleek design, often geometric shape, and bold color patterns. Most modern furniture is made out of glass, plastic, or metal. Modern furniture is simple, yet makes a very big statement. If you buy modern end tables, you’ll want to make sure they complement other modern décor in your living room. Als,o make sure these end tables are functional and can fit easily between couches and chairs. The rustic style is very popular in home décor lately, and it usually consists of new furniture and decorations that look old or have a weathered/distressed texture. The majority of rustic end tables will be made of light-colored wood and metal accents. Rustic furniture may have exposed nails, rough edges, or markings in the wood to add a barn-like look. When you include rustic end tables in your living room, the room will feel casual, cozy, and one of a kind. End tables come in many shapes and have many different features which can set them apart from one another. One of the most common shapes in end tables is a simple square. Square end tables are one of the best options, because they fit easily between furniture items and will sit flush against the arm of a couch or chair. When you reach over to grab items from the end table, you’ll have the easiest range when the end table as a straight edge. Square end tables provide a classic look as well. Round end tables will also go well between furniture if you want some variance in the straight edges of the seating versus the edges of the tables. With round tables, you’ll still have plenty of room for lamps and other items, but a round end table provides a more unique look. Round end tables come in a variety of styles from traditional to modern, so it all depends on what shape fits your living room best. Similar to the square end table, a rectangle end table is simply going to be more elongated. The rectangle end table might be best if you want the end table to be fitted specifically for one couch or chair in the room. It can go right against the arm of the furniture and hold a lamp or books with plenty of room to spare for drinks, remote controls, etc. A triangle end table is a unique shape, but it goes well in living rooms that make have a couch and love seat placed together in an L formation. The triangle end table will fit perfectly between them and a tall lamp can be placed behind the end table. While a triangle end table may seem funky, it can be very useful in filling in spaces that might not get used otherwise. Triangle end tables can also fit well in corners to make a great reading nook. End tables that have various features such as shelves below the top level can be very useful for storage or ornamental purposes. Many end tables will have either one or two shelves underneath, and these are great for holding books, trinkets, or picture frames. This allows an end table to be more than a functional piece of furniture, but a decorative item as well. End tables that have drawers provide added organization to a living room. Drawers are great for holding coasters, remote controls, charging cords, and any other small trinkets that you may want to keep out of sight in the living room. Without a drawer to place these things in, they can become lost easily or end up being throw into a pile on the coffee table, which is never a pretty sight. Transitional end tables include one larger end table with a smaller end table which fits perfectly inside the other. These types of end tables are great, because they essentially provide double the furniture without taking up space. When you need an extra small table, you can pull out the table from underneath, but it can always be tucked away when it isn’t in use. Also, many people choose to pull the smaller table out hallway, so that the end table looks stacked. That way, you get a sort of shelf effect with the transitional end table feature. 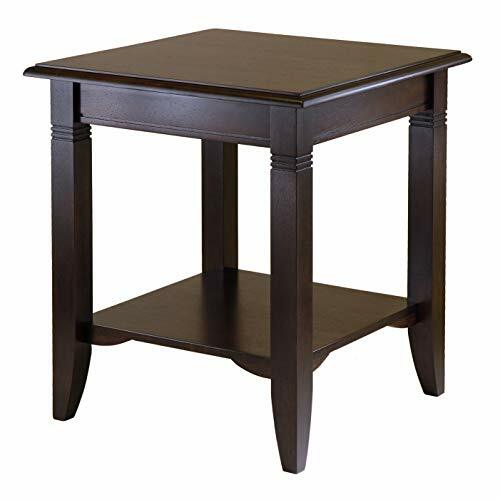 Drop leaf end tables also provide extra table space, but only when needed. The same way dining room tables can have drop leaves, these end tables have drop down sides that can be pulled up and locked in place. When the drop leaves are down, most drop leaf end tables are in a square or rectangle shape. When the drop leaves are up, the table becomes an oval or circle. These end tables will utilize space in the best way possible and give your family room for activities or meals. Like most furniture items, end tables can be made out of many different materials. Sometimes, end tables are made from a mixture of materials as well. Metal is one of the most common materials used to make end tables, and when metal is used, it is commonly mixed with either glass, wood, or stone. 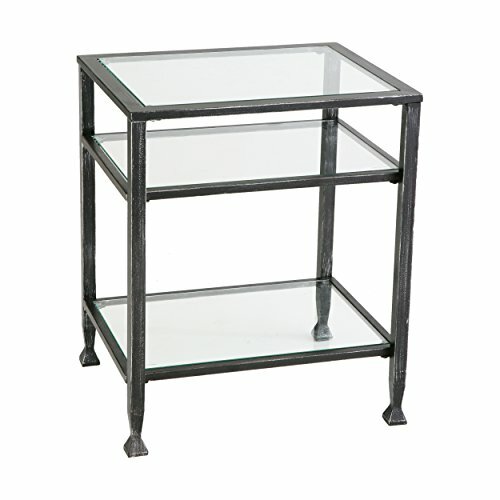 Metal is the foundation or frame of most end tables, because it provides a solid base. 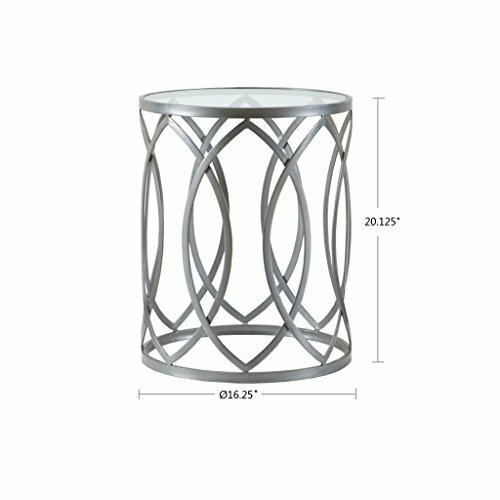 Metal is seen in many end tables that have a rustic or contemporary style. Wood is one of the most common materials used to make traditional and rustic style end tables. Of course, wood is popular in making a lot of different furniture, and it can have a variety of different looks, because wood can change in texture and color. It can also be stained to create various styles. Wood is very versatile, which is why it remains such a popular material. Many people choose glass as a primary material for their end tables, because when you place drinks on top of glass, it can be easily wiped off without staining. Glass also adds a sleek and contemporary look to any room. Whether it’s see-through glass or mirrored glass, using glass for end tables is a great way to brighten up any room, because light will reflect off it and make the space seem larger. 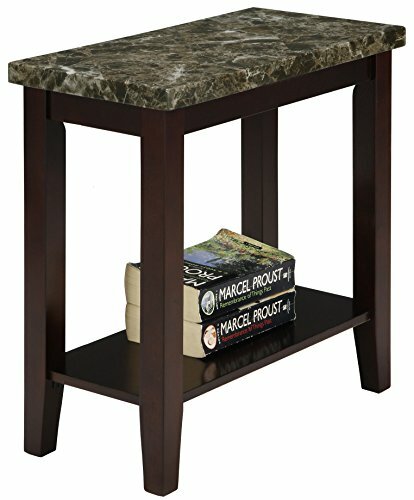 Many types of stone are used for end tables, but two popular types are marble and granite. While granite is bolder and has a deep, gray color, marble is bright white and has a more modern feel to it. Stone is a beautiful material to add to any room décor, and choosing this material for your end tables will scream luxury. 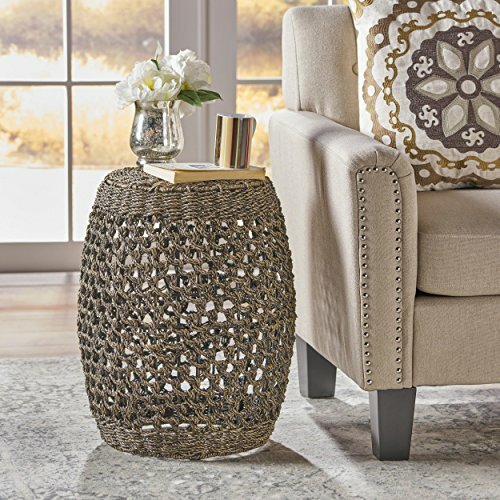 If your living room has a more relaxed vibe, you can try buying end tables made of rattan or wicker. These will be a lighter and more affordable option, but you do need to be careful if you want to place drinks on top of this material. Consider placing a glass top on these end tables or a tray of some sort to be safe. There are many local furniture stores that are sure to have a variety of types of end tables in different sizes, shapes, materials, and styles with a range of different features. If you’re looking for a specific type of end table to match the décor or shape of your current living room set up, however, your best bet is to search online. Many of the products listed above can be found at online furniture stores such as Wayfair, Overstock, or Amazon. Other popular online furniture stores include Ikea, Hayneedle, and West Elm. Shopping for end tables doesn’t have to be difficult when you know what types of end tables are out there and how these types best complement your current living room set up. Hopefully, this guide makes your shopping process simpler and less stressful!